Shipping Containers and Cars Stacked High as Colorful Eco Sculptures! 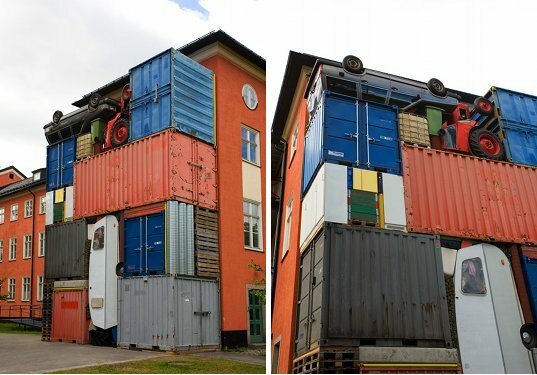 Shipping containers are often repurposed as houses, apartments and studios, but Swedish artist Michael Johansson sees them as building blocks for his sculptures. 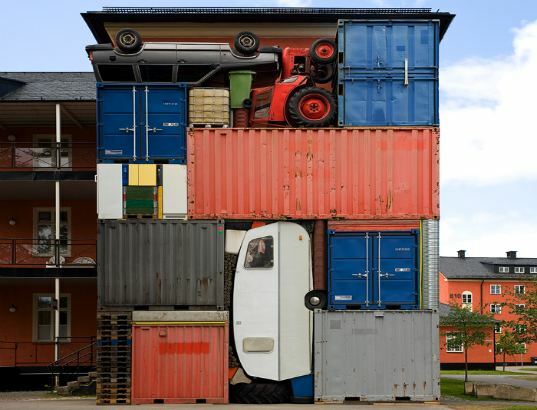 In a new exhibit in Umeå, Sweden, Johansson stacks shipping containers, shipping pallets, trash cans, a volvo, a tractor and an old RV to create art that any hipster would be jealous of. The result is Self Contained, a three dimensional temporary wall that is a fascinating collage of textures, colors and repurposed objects. Self Contained is part of a larger group exhibit called Umedalan Skulptur 2010 and went on display on June 5th and will be up until the 15h of August. The temporary wall could certainly be viewed as the remnants of an industrialized Sweden – for instance, take the Volvo stacked on top. An almost toy-like tractor rests on its back, surrounded by trash cans, while pallets support the corner of a container. The vintage tear drop-shaped trailer actually hinges on the side of a container. For Johansson, the installation is more about taking objects out of their normal context, and separating them from their function so they become solely elements of color and shape. Johansson, who currently lives and works in Malmö, is a mixed media artist with a penchant for flea markets and vintage finds. Many of his other works are similar in style to Self Contained. Each is a collection of vintage, old or found objects, neatly arranged and organized into a box or tight form. Color and texture guide the arrangement and the result is fascinating – a three-dimensional collage with surprises on every side. Colorful, yes. Also rusty and ugly. Who wants to live next to a what looks like a giant cube of compacted garbage? Also gonna take a ton of wear from the elements - there's a good reason why steel is heavily treated before being used structurally. This thing will have rust flowing from it like a red river. Really love the composition, great colors and every piece has the perfect position, it perfectly fits!